Bannockburn is a village in West Deerfield and Vernon townships in Lake County, Illinois, United States. The population was 1,583 at the 2010 census. Part of the Chicago area's North Shore region, Bannockburn has very high real-estate values; the average value for a home in Bannockburn in 2005 was $1,279,700. The Friedman house by Frank Lloyd Wright is located in Bannockburn. Location of Bannockburn in Lake County, Illinois. Bannockburn was founded by Scottish real estate developer William Aitken, who planned a community of "country estates" on 110 acres (0.45 km2) in inland Lake County. Named for the Scottish village of Bannockburn, the village began construction in 1924 and was incorporated in 1929. Aitken designed his development for the affluent members of his bridge and country club. His plan for Bannockburn featured large lots to imitate country living, and this design has been preserved; in fact, the original 1-acre (4,000 m2) minimum on home lots has been increased to two. Gradually, Bannockburn expanded its boundaries to its current 1,318 acres (5.33 km2). The Tri-State Tollway was built through the village in the 1950s, encouraging growth, though traffic noise pollution has been a persistent local concern. In the late 1960s Bannockburn's citizens, after some debate, approved the construction of the first of several business parks along the village's northern edge. It created its first commercial zone in 1984 along Illinois Route 22. Bannockburn's municipal services expanded slowly in an effort to limit taxes, but it established a police department in the 1970s and built a village hall in 1992. Bannockburn is located at 42°11′29″N 87°51′47″W﻿ / ﻿42.19139°N 87.86306°W﻿ / 42.19139; -87.86306 (42.191507, -87.863113). According to the 2010 census, Bannockburn has a total area of 2.043 square miles (5.29 km2), of which 2.02 square miles (5.23 km2) (or 98.87%) is land and 0.023 square miles (0.06 km2) (or 1.13%) is water. The Tri-State Tollway forms the village's western boundary, with the village of Lincolnshire present on the other side of the highway; the city of Lake Forest borders the village to the north, and the village of Deerfield lies to the south. The lake-side communities of Highwood and Highland Park lie directly to the east, separating Bannockburn from Lake Michigan. As of the census of 2000, there were 1,429 people, 250 households, and 222 families residing in the village. The population density was 706.1 people per square mile (273.1/km²). There were 259 housing units at an average density of 128.0 per square mile (49.5/km²). The racial makeup of the village was 87.54% White, 3.36% African American, 0.07% Native American, 5.11% Asian, 0.07% Pacific Islander, 1.68% from other races, and 2.17% from two or more races. Hispanic or Latino of any race were 3.50% of the population. There were 250 households out of which 40.8% had children under the age of 18 living with them, 84.0% were married couples living together, 3.6% had a female householder with no husband present, and 10.8% were non-families. 7.2% of all households were made up of individuals and 2.4% had someone living alone who was 65 years of age or older. The average household size was 2.96 and the average family size was 3.11. In the village, the population was spread out with 14.6% under the age of 18, 46.7% from 18 to 24, 16.0% from 25 to 44, 16.4% from 45 to 64, and 6.2% who were 65 years of age or older. The median age was 22 years. For every 100 females, there were 102.7 males. For every 100 females age 18 and over, there were 101.0 males. The median income for a household in the village was $150,415, and the median income for a family was $151,825. The per capita income for the village was $39,303. About 2.3% of families and 3.0% of the population were below the poverty line, including 3.5% of those under age 18 and none of those age 65 or over. The village of Bannockburn is home to Bannockburn Elementary School District 106, a small one-facility district of approximately 200 students from Bannockburn and communities east of the Tri-State Tollway. Previous notable students of the school have included Michael Jordan's children. Those to the west of the highway are under the jurisdiction of Lincolnshire-Prairie View School District 103. Part of Trinity International University's "Deerfield" campus is located within the boundaries of Bannockburn. Similar to other communities in the area such as Lincolnshire and Lake Forest, the Village of Bannockburn functions on a Board of six trustees, a village president, and a salaried full-time village manager that helps monitor and guide the administration and services for the Village of Bannockburn. The six trustees are residents of Bannockburn and are elected to staggered four-year terms. Each trustee is given the responsibility for a department of government activities. The village's president and clerk are elected to two-year terms. As a small community with historically low taxes, Bannockburn relies on neighboring Deerfield for a number of essential services. ^ "Geographic Identifiers: 2010 Demographic Profile Data (G001): Bannockburn village, Illinois". U.S. Census Bureau, American Factfinder. Retrieved December 10, 2012. ^ "Village History" (2008), Village of Bannockburn, "Archived copy". Archived from the original on 2010-06-01. Retrieved 2010-07-06. CS1 maint: Archived copy as title (link). 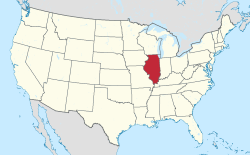 ^ Stewart, Adam H. (2004), "Bannockburn, IL", The Electronic Encyclopedia of Chicago, 109, . ^ a b Electronic Encyclopedia of Chicago, 109. ^ "Bannockburn, Illinois Map". Google Maps. Google. 2008. Retrieved 2008-11-09. ^ "Bannockburn School District Welcome". Bannockburn School District website. Bannockburn Elementary School District 106. 200. Retrieved 2008-11-08. ^ "District Map" (PDF). School District 103 Website. Lincolnshire-Prairie View School District 103. 2008. Archived from the original (PDF) on August 4, 2007. Retrieved 2008-11-08. ^ a b "About Village Government". Government of Bannockburn. Village of Bannockburn. 2008. Archived from the original on 2008-08-08. Retrieved 2008-11-08. ^ The Electronic Encyclopedia of Chicago, 109. ^ Dennis Rodkin (8 November 2007). "On the Market—Mike Ditka's Former Bannockburn Home". Chicago Mag.com. Retrieved 1 April 2012.